Sat. January 5th I joined the tri buddies Indonesia 1st year anniversary sprint race. Every time i go to any tri race of any kind there is a feeling of buzz and excitement. The transition zones are always abuzz with kit talk and preparations for the event. The sprint was slightly shorter than an actual sprint: 400m swim, 21km bike and a 5km run. Despite all the organizers having full time jobs and arranging the event in their spare time it was impeccably well organized and a HUGE thank you goes out to the tri buddies for putting together such a splendid event. 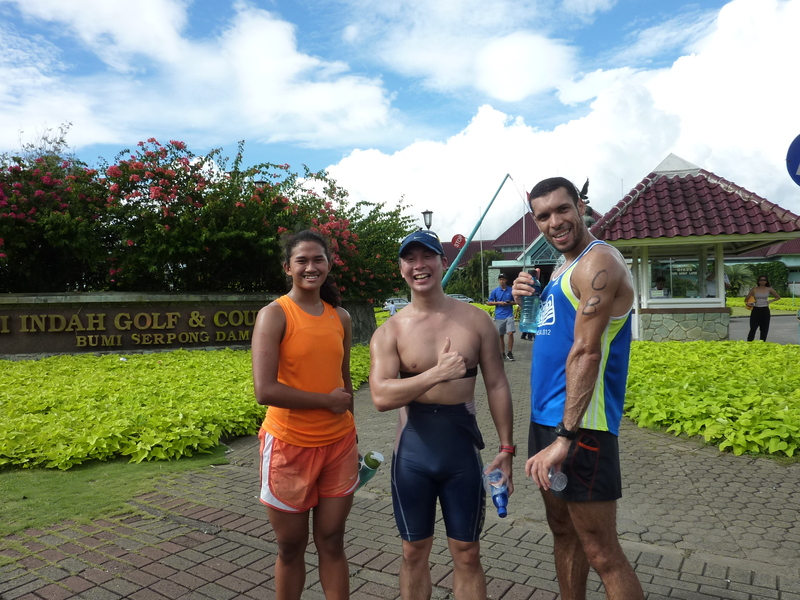 In total around 40 people participated at all levels from the very beginner to the seasoned triathlete. With a shorter distance swim I decided to hit the swim faster than I would usually go and managed to be 2nd out of the pool after an international swim athlete. However I saved time in the transitions by not wearing socks and quickly caught up with her on the bike. From there I managed to hold the lead averaging almost 31KM/H on bike course and averaging 11KM/H on the run. We’re still waiting for the official results to come out but by my polar the whole race was over in less than an hour – and it was the first time i’d come 1st in any sport (other than judo=p) so a great day out and lots of fun!